It is that time of the year, when mangoes are in season, and not just ordinary mango, but sweet, juicy and the best mangoes. Being a mango lover and mango known as the king of fruits in India, I decided to come up with this recipe. This recipe is quick, easy and refreshing at the same time. The recipe is an inspiration from the Mumbai rains coming soon, just like fragrance from the wet sand in the first rain 'Petrichor' and the smell from the sweet mangoes. Just like the lovely taste of the rainwater and the spiciness from the salad, and the freshness from the mint leaves reminds me of how fresh I feel after getting wet in the rains. It is one of those dishes that I can have while sitting on the window and enjoying the rain. 1. Chop the onions finely and evenly. 2. Deseed the mango and cut them in to big dices and keep in a bowl. 3. Finely chop the mint leaves, coriander leaves and keep ready. 4. Now in a bowl, take the chopped onions, diced mango, add in the mint, coriander, lemon juice, chilli flakes and mix well. 5. 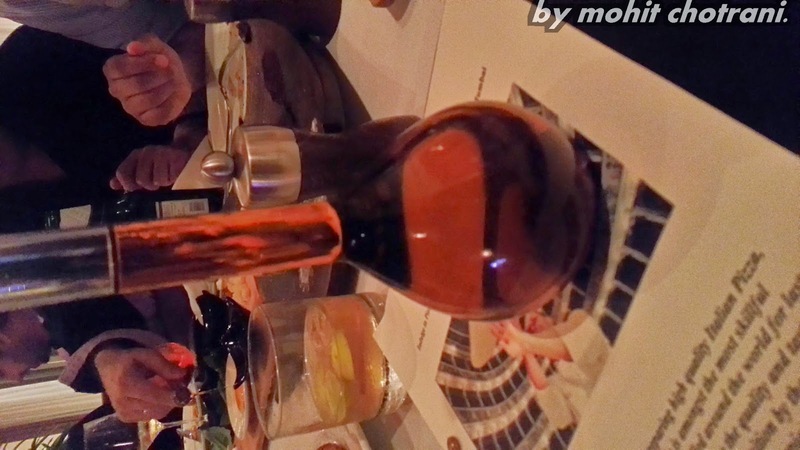 Season well and adjust the spiciness according to taste. 6. Keep in the fridge to chill for sometime. for updates on food, recipes and more. 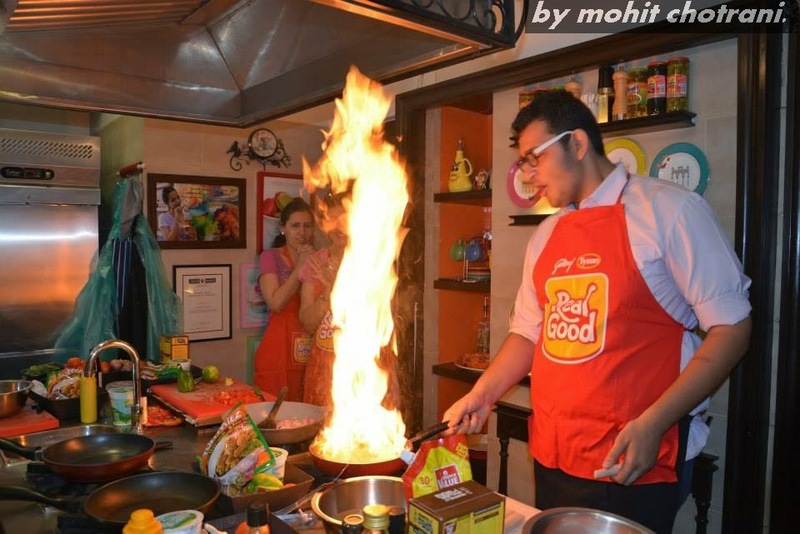 Youtube Channel - Fat Toxic Bawarchi for video recipes, restaurant reviews and lots of fun. The following are the participants of the competition this month. 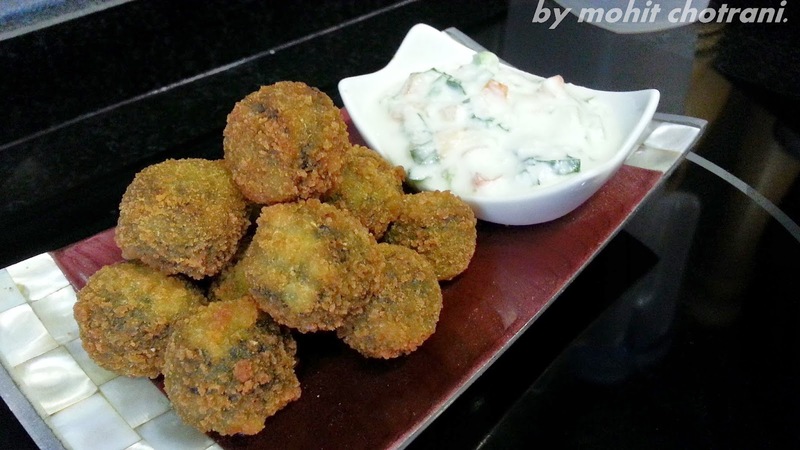 Do check out the recipe and how they would enjoy A Date with Mumbai Rains. 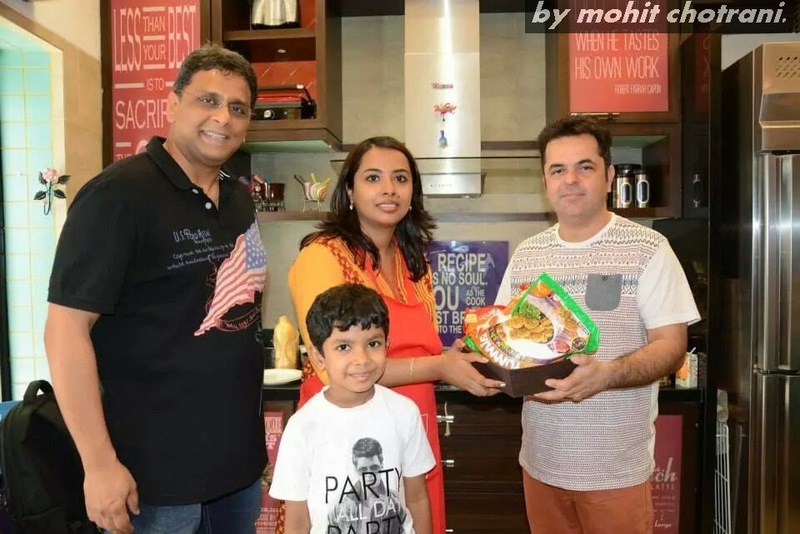 On May 20, 2014, a new chapter was written in the books of KitchenAid when there was an event organized which consisted of 2 of the greatest names in the kitchen industry, Chef Vikas Khanna and KitchenAid. 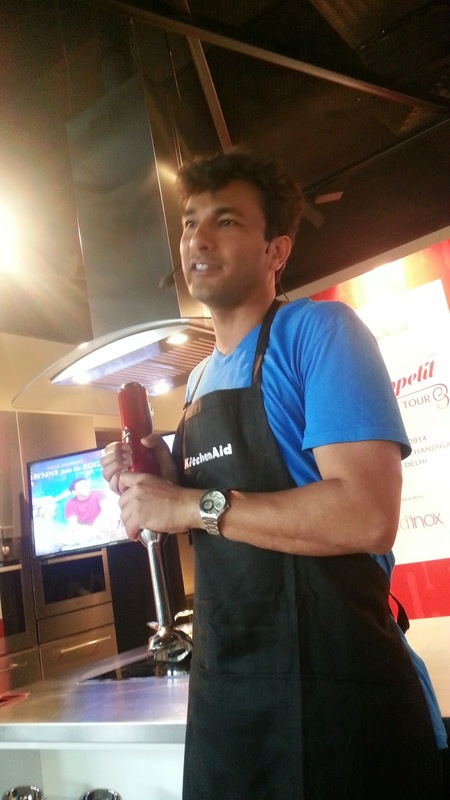 KitchenAid India today launched its powerful and sophisticated dynamic appliance - The KitchenAid Pro Line Cordless Hand Blender in association with Masterchef Vikas Khanna in Mumbai. While, the cordless blender is a unique, first of its kind, versatile product, it comes with an ultimate experience of ‘anytime anywhere’ blending. That day, Chef Vikas Khanna launched his 15th book- Hymns from the Soil, the first book on Indian vegetarian food and a tribute to Mother Earth and her offerings. The cordless hand blender is a magical kitchen wand that comes equipped with a rechargeable battery which gives it the power to perform efficiently. 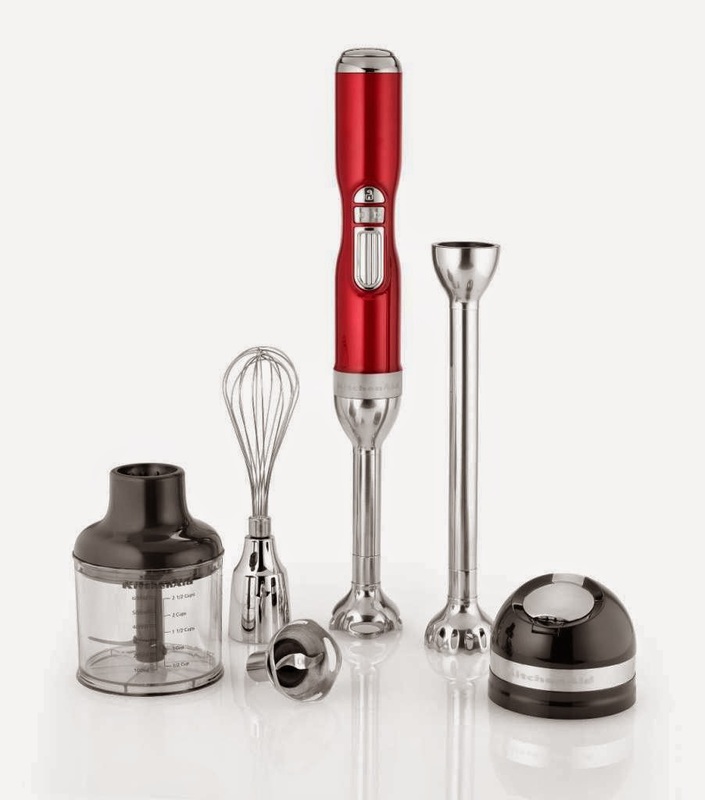 The super blender can blend, mix, whisk, chop, froth, puree, shred and whip up anything in a flash. 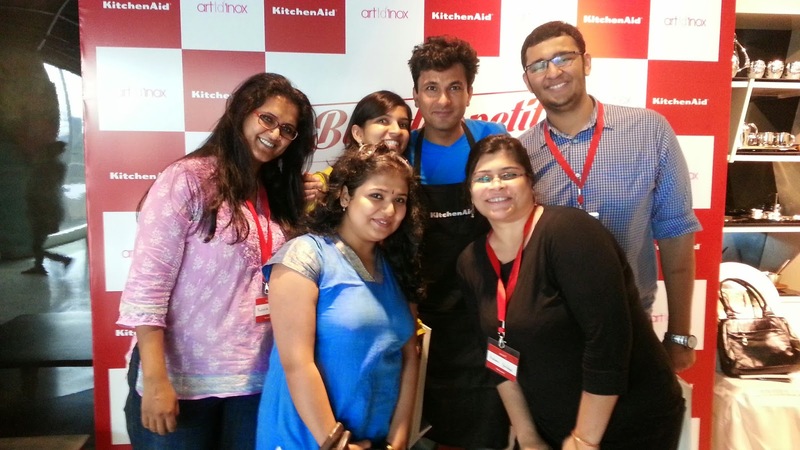 Vikas Khanna added, “It feels great to be associated with KitchenAid India since I have spent many years innovating recipes with the brand’s iconic appliances. The Blender is a great tool for the kitchen and a must for people who are versatile and like creativity in their cooking style. 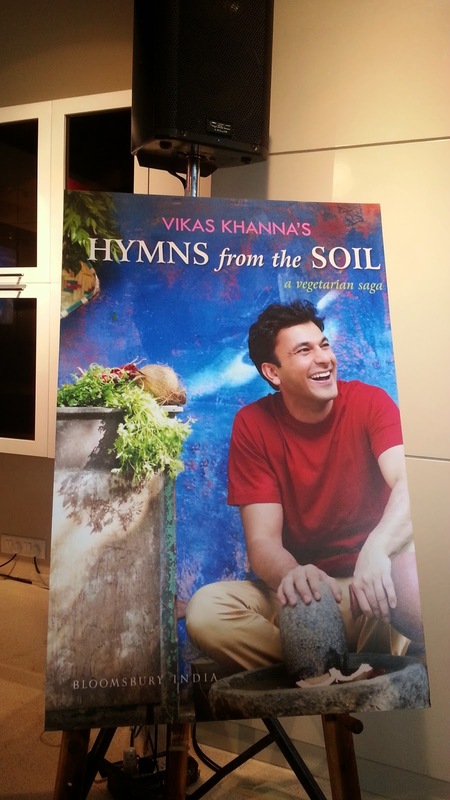 I also feel proud to launch Hymns from The Soil, a vegetarian saga along with KitchenAid. “Hymns from the Soil”, is an exquisite amalgamation of gentle, pure, heart warming vegetarian food that sings with the nature’s produce. In India we often call our soil, the Mother Earth or Dharti Maa. Mother Earth, in all languages, cultures in India is synonymous with the gentle, soothing, caring mother who loves and lives for her children. The beautiful vegetables and fruits growing in the purity of the soil are yet another form of her love and affection for her children. With “Hymns from the Soil” Chef Vikas Khanna offers his gratitude and prayers to Mother Earth for her abundance. The recipes in the book draw the attention to the purity and spirituality of vegetarian food. The book revolves around vegetarian food. It also brings the food journey interspersed with Vikas’ own personal journey - whether it is going back to his kitchen garden in Amritsar and waiting for the cardamom to grow as a curious child to exploring the cardamom spice farms as an adult. This is one of those great books vegetarian i have read in a very long time. The book is full of beautiful pictures, and short stories and lovely recipes, devoted to the mother earth and thanking it for the wonderful produce it has given us. 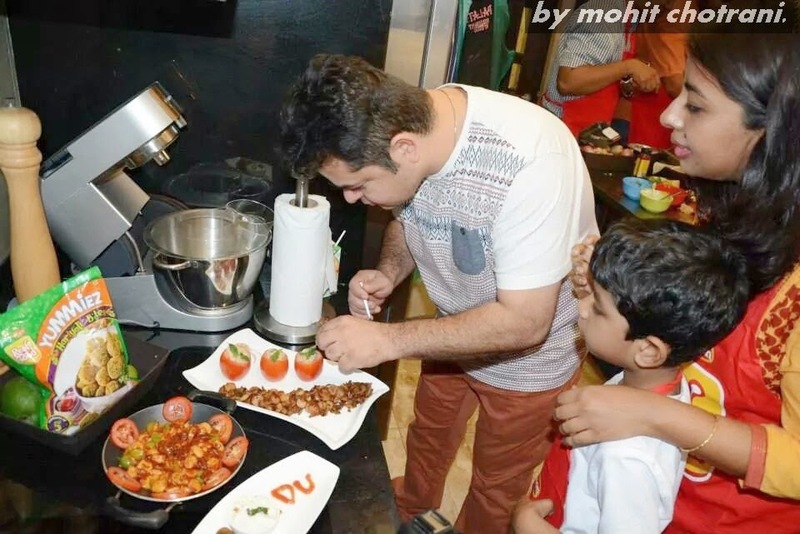 While the event was on, and Chef Vikas, had revealed the KitchenAid cordless hand blender, he was into telling us some short stories which he encountered while writing the book and clicking pics. One story which I remember was that he had his friend from France who was taking pictures for them which were suppose to be in the book. The came across a lady on the roadside selling mangoes, she would be in her 80s or so. She had five mangoes in all which could would sell and earn money, then the photographer friend wanted to take a picture of the old lady, and he told Vikas to tell her to allow her to take the picture as there was a language barrier. The friend somehow managed to communicate the message in sign language and the lady allowed her to take the picture. After the shot was taken, the lady wanted to see the picture and when she saw the picture, there was a smile on her face and then handed over one the mangoes to the person. He was like, i cant take it and tried to offer her money instead, but she refused to take it. This short story, made me realize again that, communication by words is not important, but the feeling and the words straight from the heart are which is necessary. 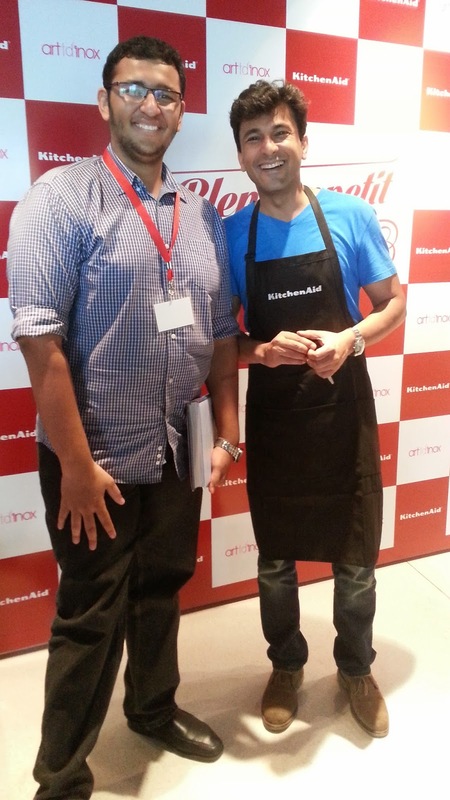 At the launch i got to meet one of the greatest personalities in the kitchen industry, and meeting him was on my wish list from a very long time, which is now checked. Not to forget, he also demonstrated the blender and made an amazing looking kiwi slush, juice, dont know what it was, but it was for sure amazing. 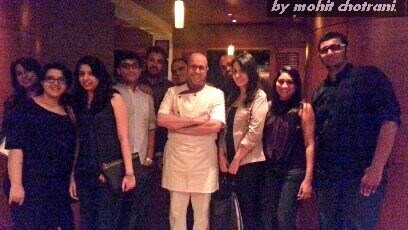 Before leaving the, there for sure had to be some interaction with the chef himself, and to be honest, i havent met a person like him in my entire life. Just amazing, so down-to-earth and friendly. And meeting some of my Blogger friends, we had to take a group picture. the event wouldn't be over without that. This recipe is one of the quick and easy one. 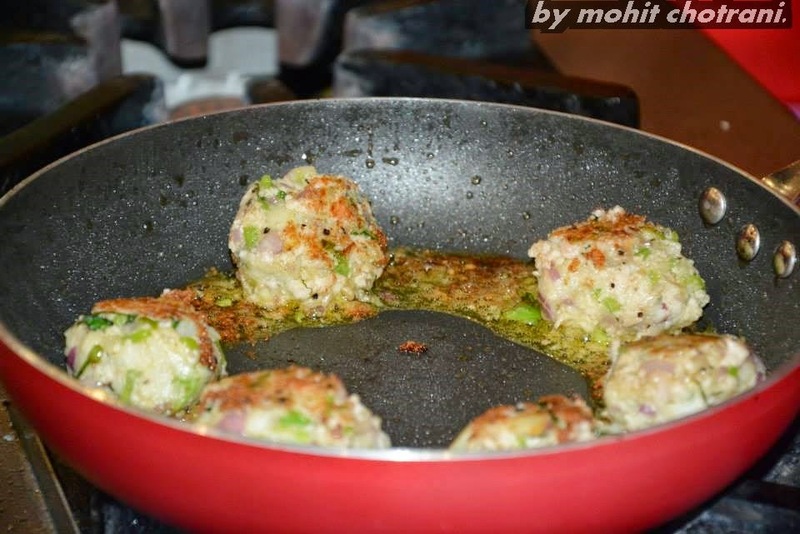 The thing which inspired me in making and developing this recipe was, on the occasion of Mothers Day, where i wanted to cook something for my mom, as she likes quick and easy recipes with minimal ingredients and flavor. Black pepper - to taste. 1. Chop the onions, capsicum and keep them in a bowl. 2. Peel the potatoes, and keep them for boiling. 3. 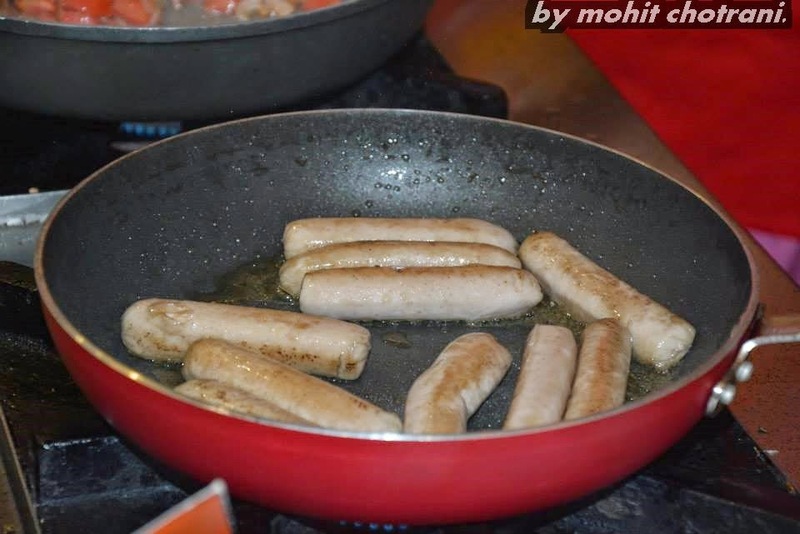 Thaw the sausages, and cook them in a pan over medium flame. 4. In the bowl of the onions and capsicum, put in the sausages and mash them, keep some aside. 5. Add in the grated raw mango, season with salt & pepper and chilli flakes. 6. Once the potatoes are boiled, add them to the bowl and mash them and mix along with the sausages and add in breadcrumbs if needed for binding. 7. Slice the remaining sausages diagonally in thick slices. 8. Make croquettes of the mixture and stuff the sausage in the middle and shape in the form and shallow fry till golden brown on both sides. 9. Serve along hot with the Tzatziki. 1. Take the yogurt and hang it in a muslin cloth for sometime, so that all the excess water is drained out to obtain hung curd. 2. Chop the onions, green bell peppers, tomatoes and keep aside. 3. 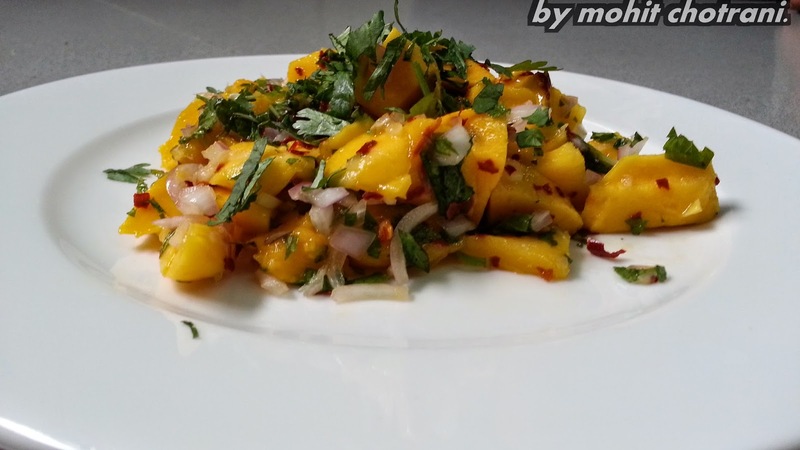 Grate the raw mango in a bowl and add it to the vegetable mixture. 4. In another bowl, take the hung curd, add in the vegetable mix and season and mix well. 5. Add in some chopped mint, lemon juice and mix well. 6. Keep it in the fridge to chill. 7. 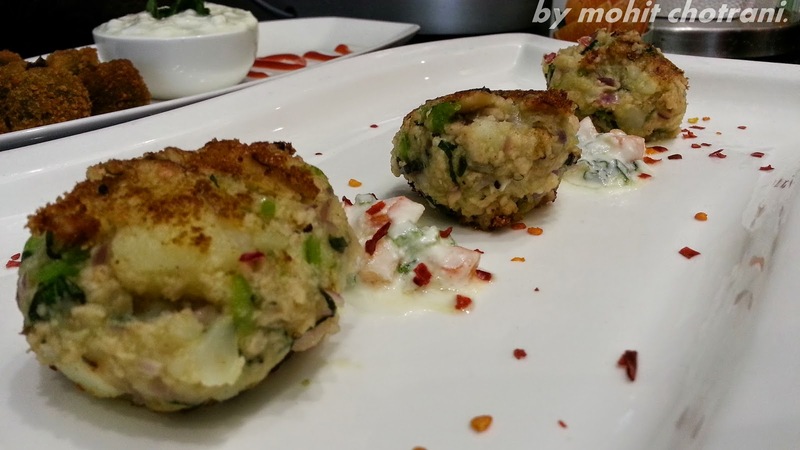 Serve along with the croquettes. 1. For the Tzatziki,, flavoring of choice can be added. 2. Coat the croquettes in breadcrumbs for an extra crispiness. 3. Stuffing can be replaced with the choice. 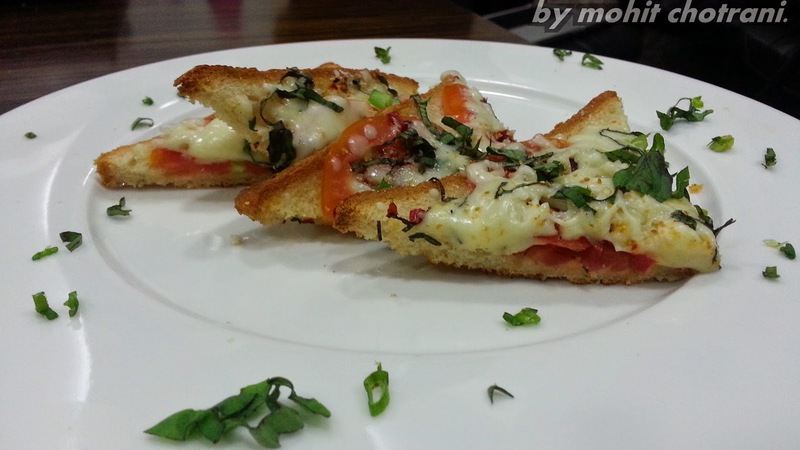 One easy, quick recipe for anytime of the day, full of flavor, aromas and taste. 1. Cut the baguette in thick slices. 7. Put in the oven for about 5 mins or till cheese melts. 8. Serve hot with drizzle of little olive oil. 1. French baguette can be substituted using normal bread or brown bread. 2. If sun dried tomatoes are not there, normal firm tomatoes can be used instead. 3. Sprinkle chilli flakes, if want it spicy. 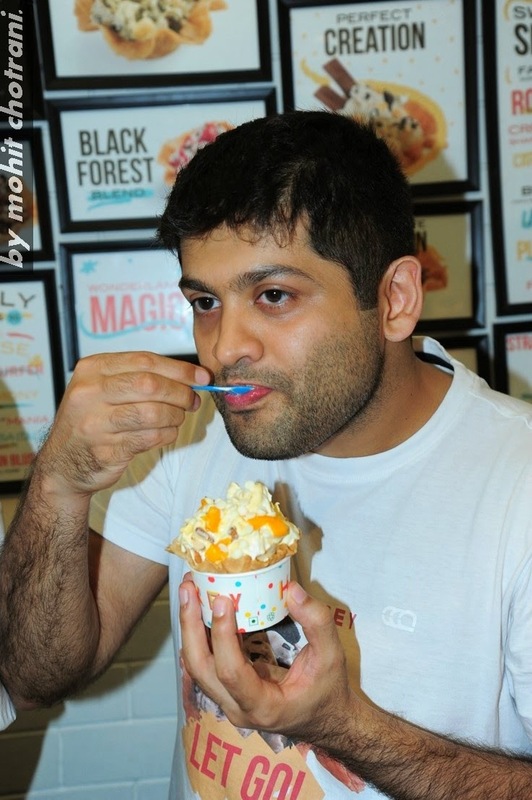 Ice-cream is such a thing, that everyone loves, may it be the child, the teenager, the grownup person or an old person. Everyone loves to enjoy and have a scoop or two of ice-cream every now and then, may it be with their loved ones, or alone. The invention of ice-cream was such a great thing in my opinion, coz it is one of the best ways to beat the heat, keep yourself calmed down and everyone likes to pamper themselves once in a while. 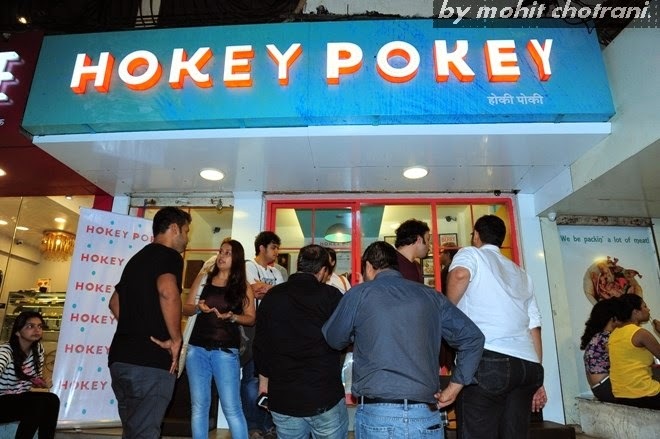 One fine evening I was called at an ice-cream parlor in Bandra, Carter Road, known as Hokey Pokey, honestly speaking, one of the best parlors serving ice-creams. 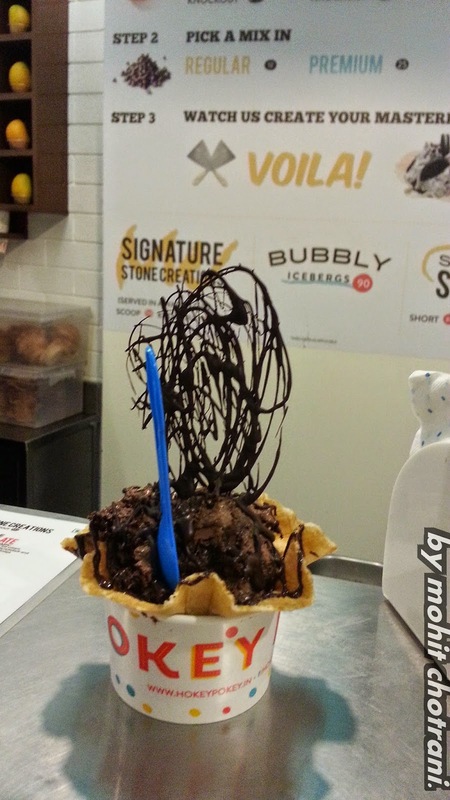 The concept the parlor uses is a cold stone preparation, in which, the ice-cream scoop is put on a cold granite stone which is temperature controlled, then the person behind the stone, put in the topping requested and mixes well with the ice-cream to take the simple ice-cream to a whole new level. 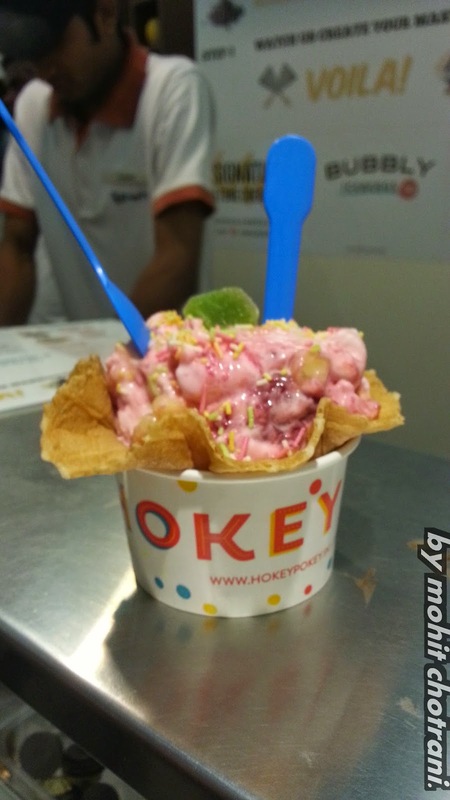 The concept of the cold stone is adapted from the States, and Hokey Pokey is I guess the only parlor in India having such a concept for ice-creams. 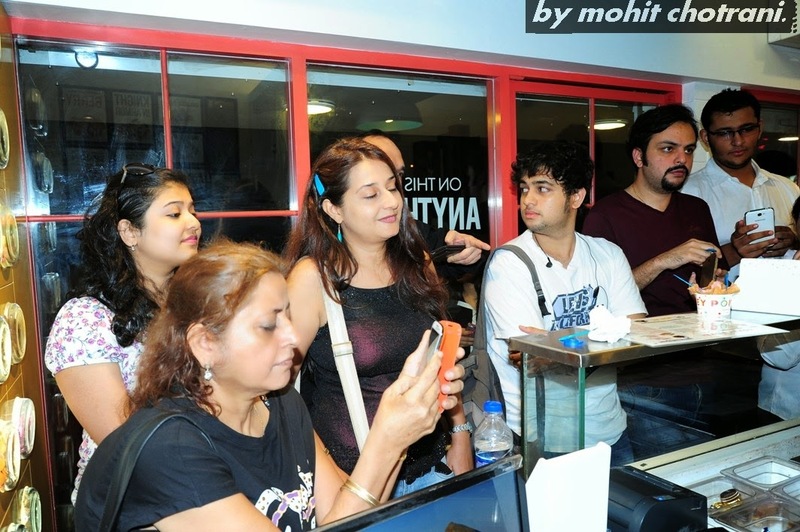 Soon the invited Food Bloggers and the founder of FBAI - Food Bloggers Association India - Sameer Malkani, started arriving and gathered outside the shop and got engaged into talking to each other. There was jokes been cracked, the atmosphere was very jolly and everyone was in a very happy mood, had a big smile on their face, we all were welcome by the PR incharge Rhea. 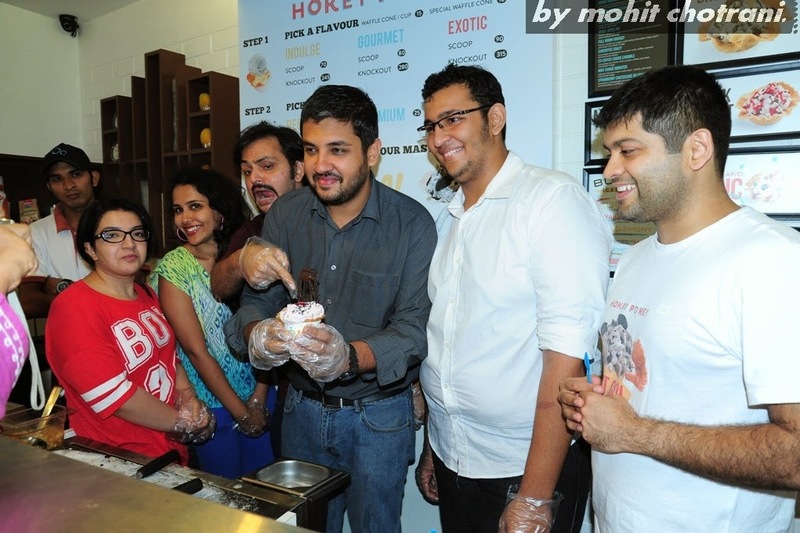 The owner of Hokey Pokey - Rohan came and we all started talking to him and chilling out. 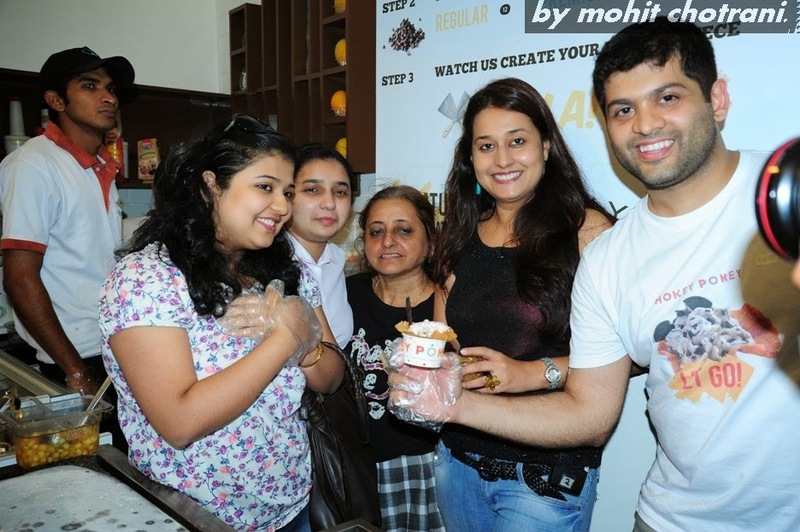 The Food Bloggers interacting and enjoying. We all went inside and then we all were sampling some of their creations and were show how the ice cream is made, how to mix the additional flavorings. Some of their best selling creations were, The Knight & Armour, The Chocolate Therapy, another one was the Very Very Berry. While the people behind the stone were making this, we all were eager to see how it is actually done, and how quick they are. We all dint stop at just these flavors, and wanted to try others as well and then they all came one by one, and there were almost 6-7 mini tubs given to us which people found less, as there is no age for eating ice-cream. 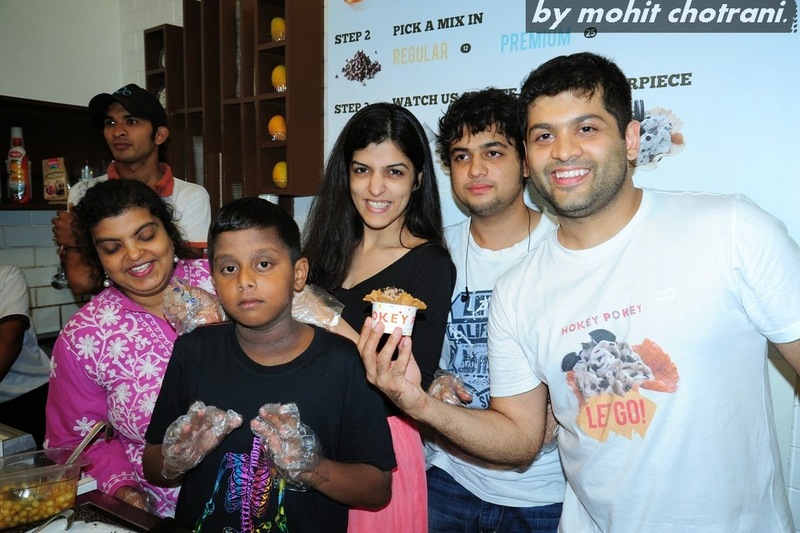 Then it was Rohan's turn to make the ice-cream for us and tell us about the company, how it started, what made him do this, what are the business plans. He also told us, how the ice creams are made, what is the secret to obtain the richness, the smooth texture and the amazing flavor of the ice-cream. He also told, how did it all start, with the conversation we came to know that there are also tubs of 500ml sold in supermarkets. With this, we all got a surprise, we were told that we were divided into teams of 4 and had to go behind the stone and make 3 creations each. At first, i was like, why always there a competition or something like that. Then all took up the challenge, we were also told, that the best creation made by the teams will be put up on their Hall Of Fame and their menu. 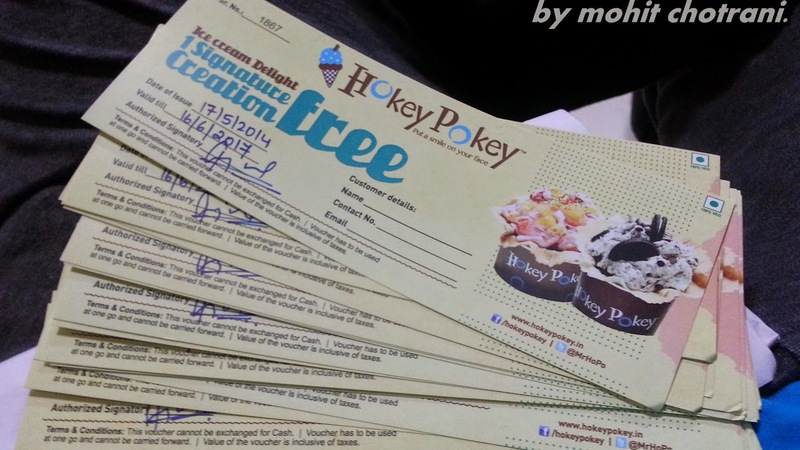 And the winning team will win coupons with a months validity which can be exchanged for a free signature creation at any of the hokey pokey branches. 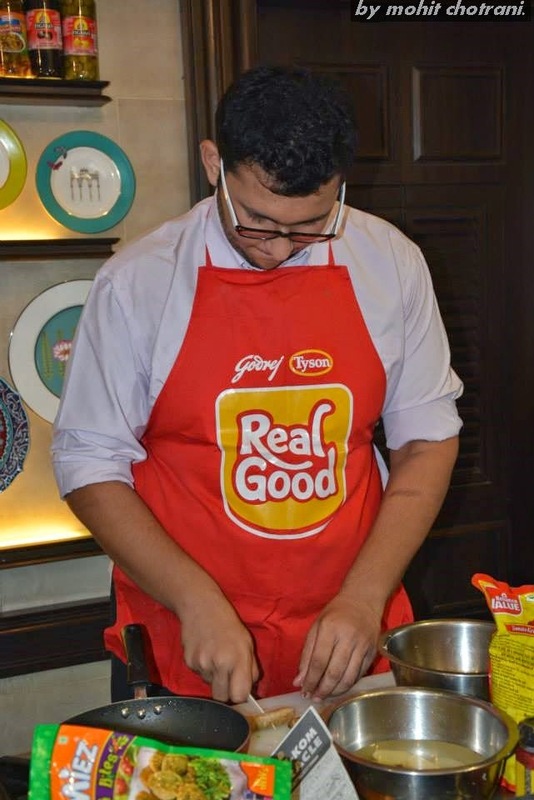 Before the competition started, Rohan revealed some mystery ingredients which they were going to launch soon, like peanut brittle, honeycomb, indian sweets like rasgulla, gulab jamun and more. 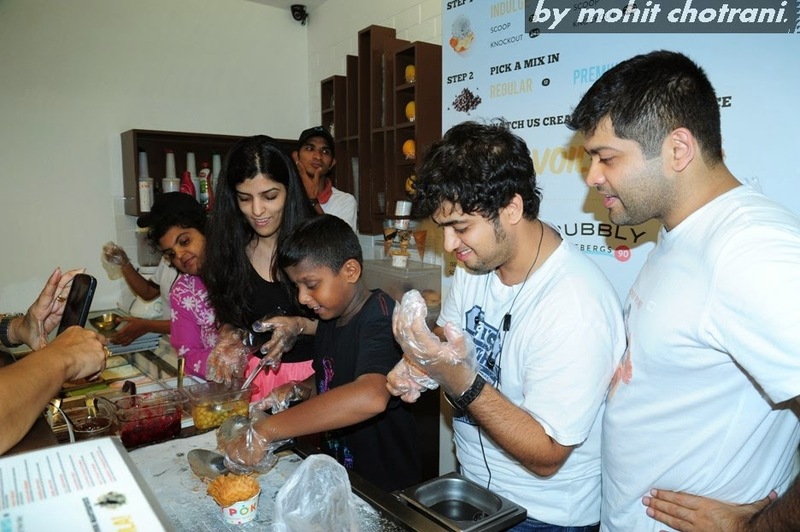 Teams were made, all got busy in deciding what to make, and the first team went behind the counter and began making. It was pretty exciting and fun to see them make it and trying hard to win. It was good to see them come up with different ideas and flavors. 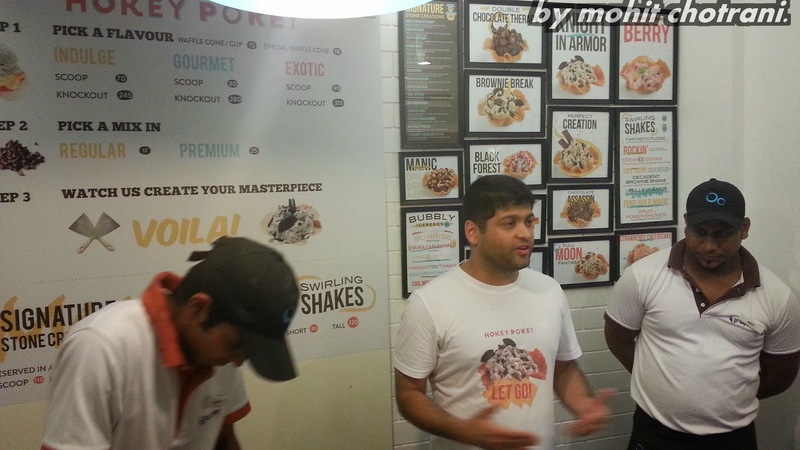 Team 1 was done, and it was time for Rohan to taste the creations and grade them on the basis of taste, innovation and use to flavors and toppings. 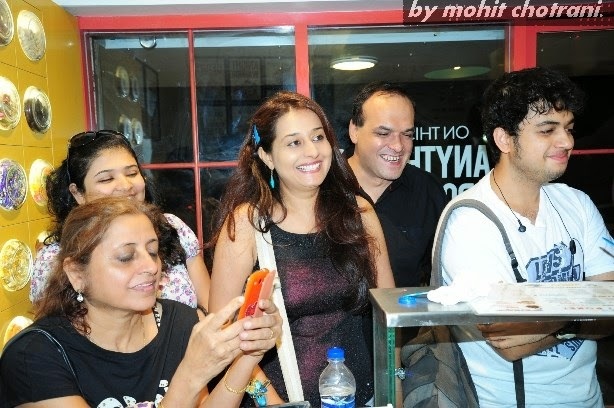 Then the second team went, and while they were at their making, there was a team in the corner of the shop which had, Jahan Bloch, Bhisham Mansukhani, Anu Menon, AB and Me who were busy brainstorming and deciding on what to make. We tried almost tasting all the flavors one after the other. We all came up with different, different ideas like, coffee and mango, mango and chocolate etc etc. What flavors to use in the creations was our main concern and after everyone's decision, we all decided on 3 flavors, Mango, Coffee & Chocolate chip with Strawberry. 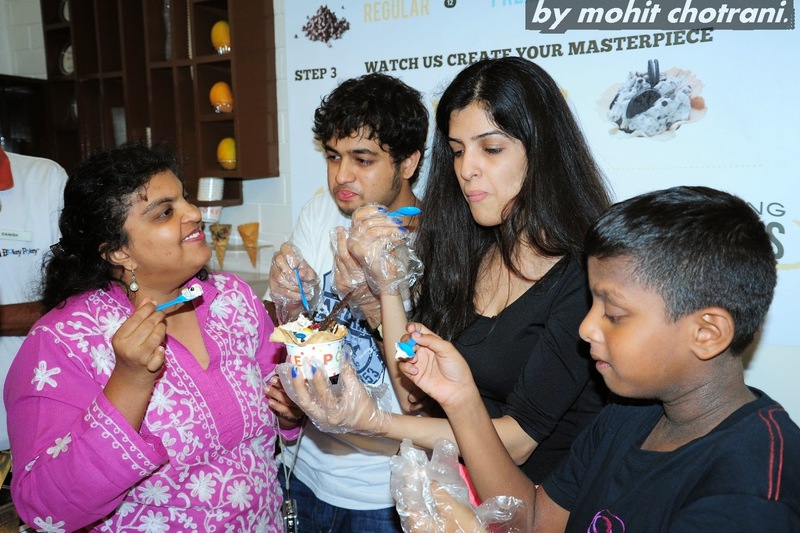 While the brainstorming was going on, there was Team 2 already done with their creations and Rohan was tasting them along with the team as well. Team 2 tasting their own creations. Now it was turn where we had to step behind the counter and make the creations and show everyone the talent which was hidden inside all of us. 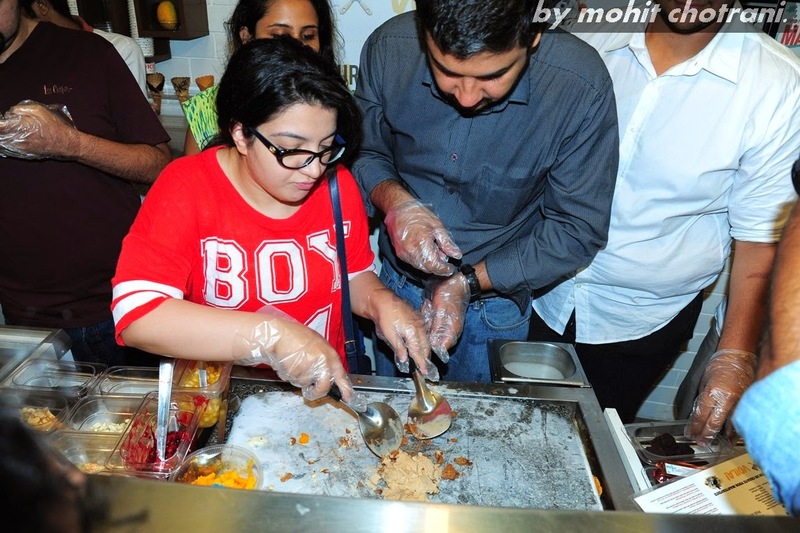 We started making the 1st creation, which had Fresh Cream, Roasted Almonds and Mango Ice-Cream which was then finished with fresh chopped Mangoes. 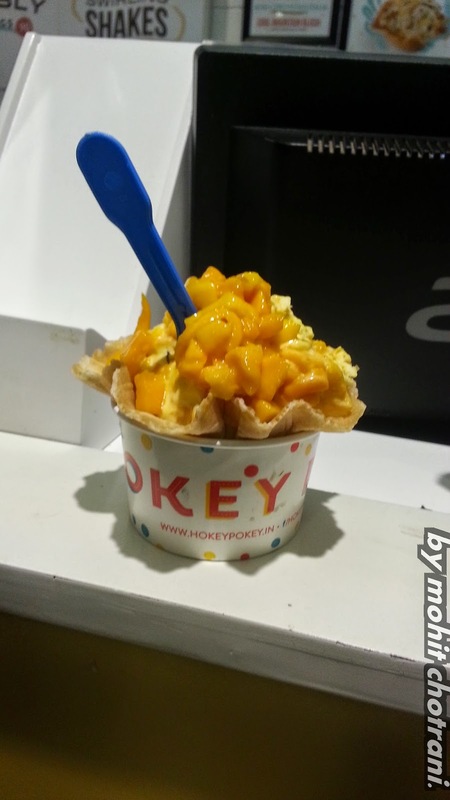 This creations was named 'Aam Aadmi', the reason being the the fruit Mango - Aam. While the tasting of the 1st creation was going on, the team started with the second creation. We took the Coffee Ice-Cream and started thinking what to mix along with it to obtain the wining creation. The secret ingredient comes out, the honeycomb which was one of the new ingredients and it was a must to use in some creation. Along with the honeycomb, we took chocolate chip brownies, and mixed all them to get the creation ready. There was no name for it in the mind and suddenly there was a name suggested, 'Secret Affair'. And 'Secret Affair' is was, the name of out second creation. Team 3 fully concentrated into the making of the creation. The second creation was ready and served, and while the tasting was happening and the scores were given, it was turn for the third and the last creation to be created 'The Mental Mix' it was. The mix consisted on Strawberry Ice-Cream mixed with Chocolate Chip Ice-Cream and there were Strawberry coulis, and some preserved cherries topped with a chocolate garnish. All the 3 creations were done, and it was that, wish we could create some more, it was soo much fun. The last creation by team 3. Now that all the teams were done with showing their creativity, it was time for the results to be revealed, Rohan went out to tally the scores and we all had to wait inside. So there was Rohan coming in the store with the results and the winner was announced, it was 'Secret Affair', and the team heard the name, we were actually surprised. I told myself, the brainstorming that we did before the turn was of no use, it dint help us much, but we got to eat ice-cream though. So we were announced the winner and was awarded with our creation 'Secret Affair' on their Hall of Fame and their menu and we all the team members got coupons which can be exchanged for a free creation with one month validity. To end the evening, Food Food India channel had come over to cover the event and before we could leave the place, we were caught by the channel people, the reason being we had go give a byte and answer some questions. The evening came to end with everyone happy and enjoying themselves, and a stomach full of ice-creams. For this I would like to thank the Food Bloggers Associations India, Rohan - Hokey Pokey owner and all the Food Bloggers who had come there. Mothers Day, the word it self tell that its dedicated to all the mother around the globe. On this day, every child wants to do something special for his/her mother to make her feel special and give her a token of appreciation in return for what she has done till date. The raising up, the taking care, feeding, playing, teaching, a mother plays soo many different roles in the life of the child and plays till death and in return never asks for something. So in return, the child wants to give her all the happiness she deserves and make the day special for her. 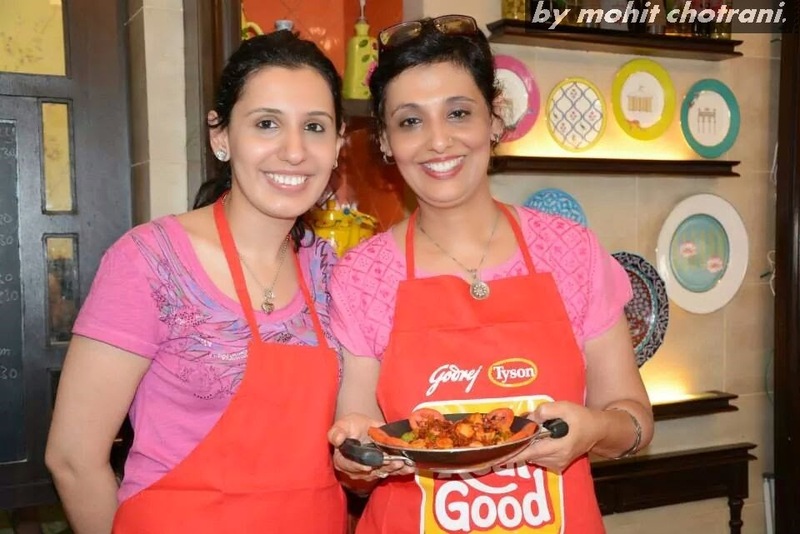 On the occasion of Mothers Day, this year I got a chance to experience a wonderful thing, to stand up in a cook-off along with my mom on my side help me competing against other mother daughter/son duo. But as they say in Mumbai, that it is easy to find a job, but difficult to find a maid, and that difficult made caused a problem for me for the competition, my mom dint come because the maids were more important that the competition and the mother-son duo. So after arriving at the Palate Culinary Studio, i was in love with the place, it was like a perfect kitchen, which i always wanted, it was cute, simple, colorful, gave that homely feeling and felt like just to stay here the whole time and cook and cook and cook. I had planned alot for this day, that ill be making soo many different things, but the moment i arrived at the place and had a look at what all we are going to get, my whole planning was a waste, as the things i expected were not there. I started to use my brains and began thinking on what can be done with the ingredients provided, what i can make, how can i do something to impress everyone. 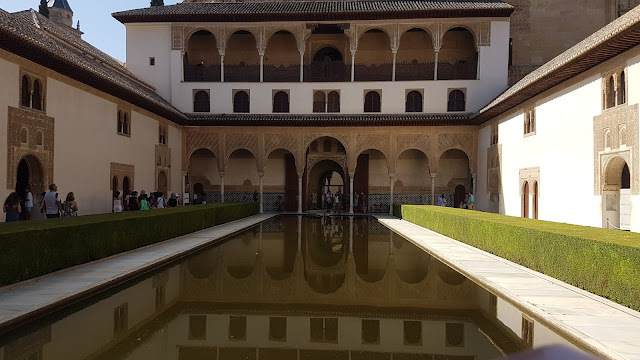 Then people started arriving, and i got a bit more worried, there was a grandmom, who for sure has lots of experience, then there was a mother-daughter duo, which seemed chilled out and had no tension, then there was a mother with a 6 year old son, the youngest chef i must say. As soon as i got the things i needed, there was like a fire in me which said, lets rock it and made my determination full. 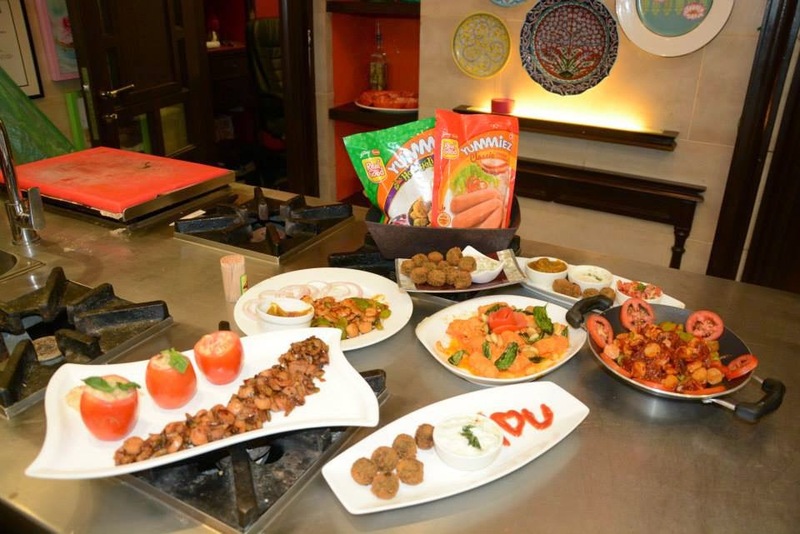 We had a challenge to cook 2 dishes using the Real Good Yummies sausages and the hara bhara bites, and had to be innovative and use them in whatever way possible. Everyone got busy cooking and doing some chit chat, asking what are they going to make, so they can steal some ideas. There were lovely aromas in the kitchen, there were noise of pan sizzling, vegetable being chopped and amazing dishes in process. Everyone was making what came into their mind at the moment, and looking at them, it dint look like it was like a surprise for people. 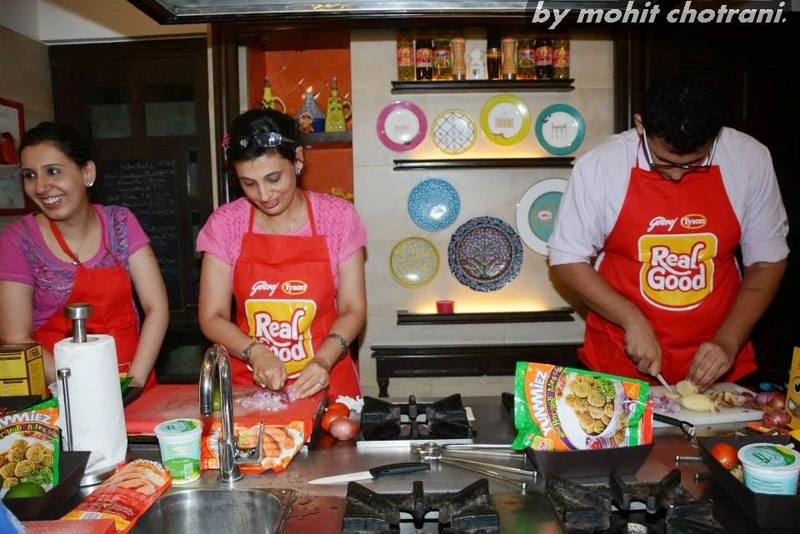 As time was passing, i could see that food is getting ready and people are plating up the food, getting ready for the tasting which was going to be done by Chef Vicky Ratnani. After knowing that he was going to taste the food, i had to give it my best, and make something special that he would love. On my table i had a croquette stuffed with sausages which was served with a tzatziki and then the hara bhara bites were served with a raw mango flavored tzatziki. The dish was soon completed, then started the plating, and ready to be served to the Chef for tasting. The Croquette consisted of a base made from vegetables and potatoes and some mashed sausages and then were stuffed along with a piece of the sausage in the middle to act like a surprise. Soon each team was ready with their food, and were eagerly waiting for the Chef to taste the food and grade them the accordingly. 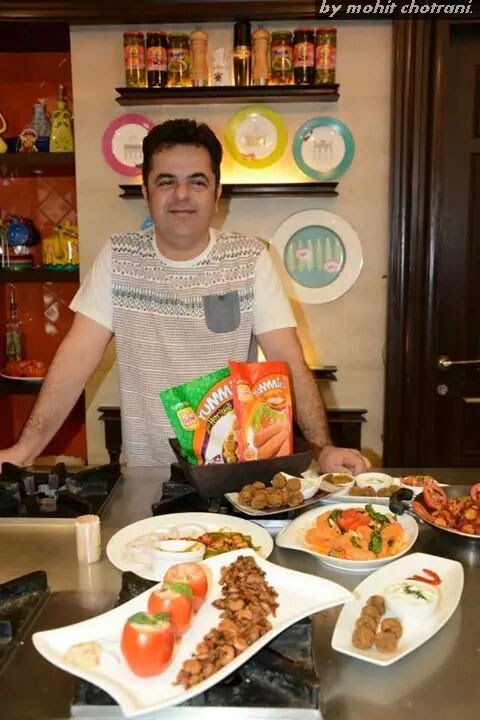 All the food was set, and the chef had began doing what he best at, the tasting and judging the each one according to the taste, innovative, presentation and the usage of the core ingredients. It seemed to be a very difficult competition, as by looking at him, it could be noticed that it was difficult to judge and score each dish as they all looked amazing and tempting, i just wanted to dig in all of them and eat up. After all the dishes were tasted, the chef, announced the winner, and no doubt, i personally found the dish my self amazing in taste, presentation, and innovation. It was my old friend Purabi Naha along with the youngest sous chef in the kitchen, her son who help her in making this wonderful dish. And i think i know the reason she won the cook-off, it was because of the little help from her son, which made all the difference to it. Im sure if i would have had a chef like the small one along me, even i would have won. 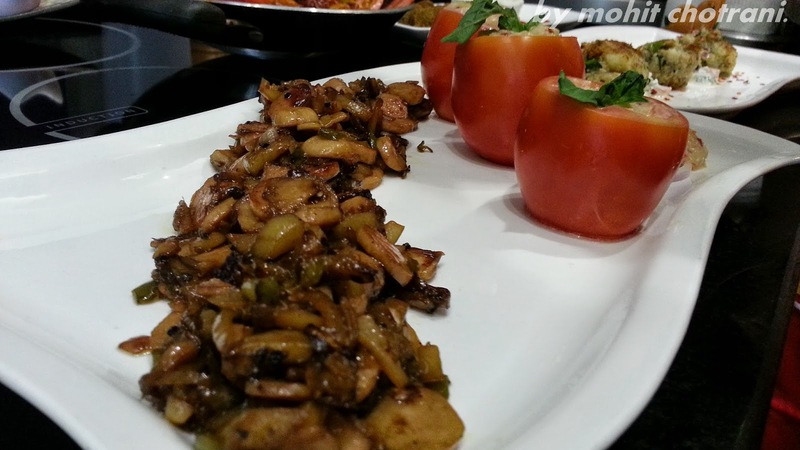 The wining dish which Purabi Naha had presented, was a stir fried veges like dish with sausages and then it was the tomatoes stuffed with the hara bhara bites and a secret chutney on top. After an amazing cook off, there lunch for everyone, where they all engaged in talking and chit chatting, then there was clicking photos, discussing what more could have been done and how everyone like each others food. 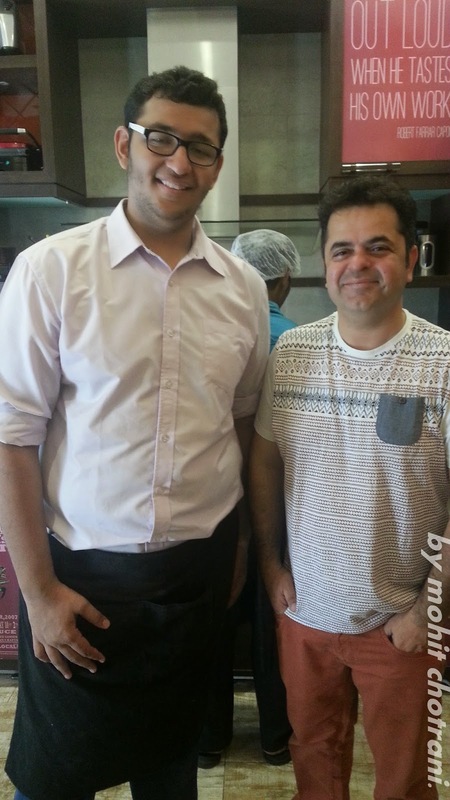 I was lucky that i got to meet the Chef Vicky Ratnani once again and honestly speaking, he is a very chilled out person, got know him more and how a gem of a person he is. To end the event, we had everyone dedicating a lovely message to their mothers and how they are thankful to them. And then it was the chef giving out a special message for the mothers day and how he enjoyed the cook-off. And before leaving, as they say that ek photo to banta hai, it was time for the group picture, including all the big names present over there, the Chef Ratnani himself, to the owner of Palate Culinary - Rakhee Vaswani, to the founder of FBAI - Sameer Malkani and the participants and not to miss the youngest chef of the wining jodi. Finally, this Mothers Day was one of the best days i had spent, it was full of fun, cooking, enjoyment, building friendship and making it special for the mother. 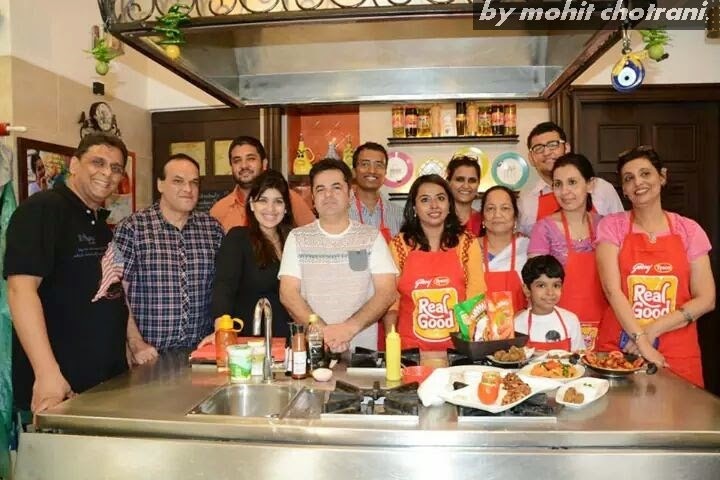 All the credit for making this day all the more special goes to all the people present, Palate Culinary Studio, the owner - Rakhee Vaswani, the founder of FBAI - Sameer Malkani, Yummies Foods for providing with all the fun, help and organizing the event. 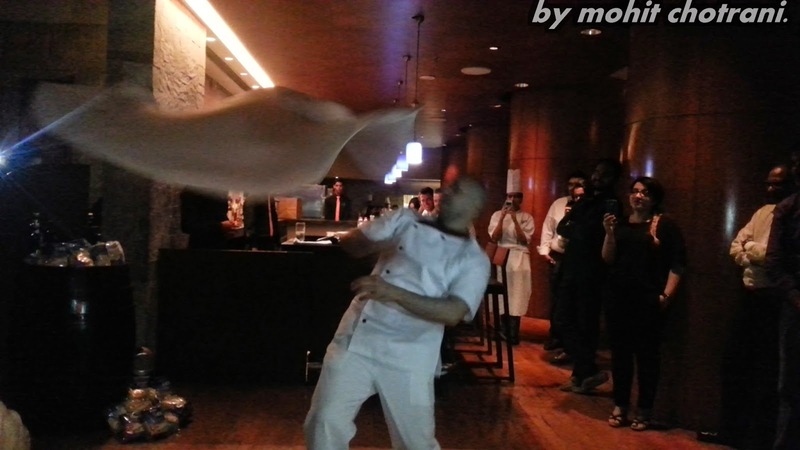 Some Chit Chat, Gup Shup and Pizza Dough Juggling with Chef Pasqualino Barbasso at J W Marriot. 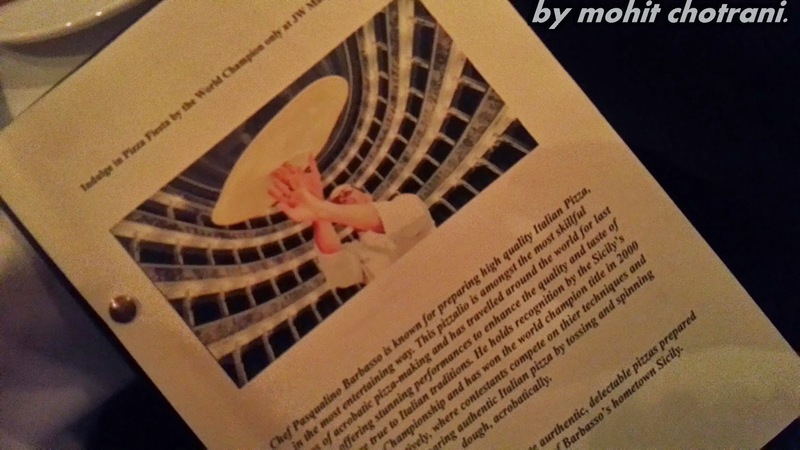 What couple of hours spent with the champion of pizza acrobat Chef Pasqualino Barbasso was like ? To being with who is Pasqualino Barbasso ? Pasqualino Barbasso is a pizza chef a mission, to make high quality Italian pizza and to do it in the most entertaining way. 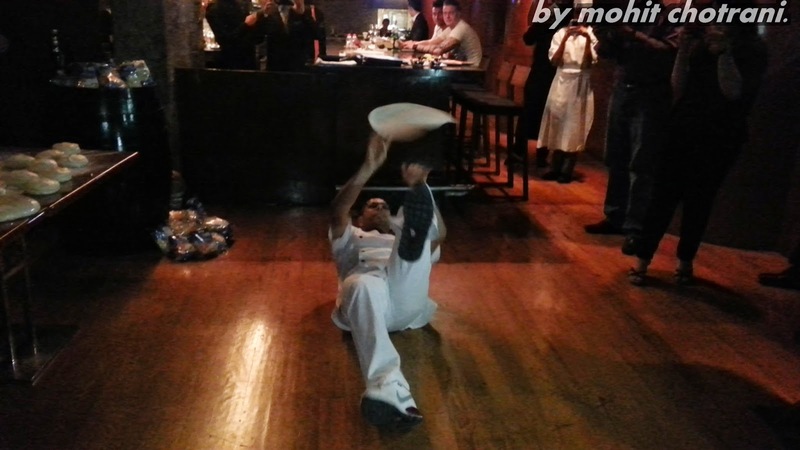 This 36 year-old pizzaiolo is among the most skillful masters of acrobatic pizza-making and is one of the most famous. Pasqualino has travelled around the world offering his stunning performances, training people and teaching them to enhance the quality and the good taste of Italian pizza made according to true Italian traditions. Pasqualino began his career in his family’s Pizzeria, Il Falco Azzuro, in Cammarata, in the Sicilian province of Agrigento, where he still works when he’s not travelling. He underwent formal pizza-making training only at a later stage, because, as he puts it, “the profession of high quality Italian pizza-making is something that one cannot learn only in an empirical way.” In 1998 he won the Sicily’s Acrobatic Pizza championship. By 2001 he was World Champion, a title that he won in 2002 for a second time. 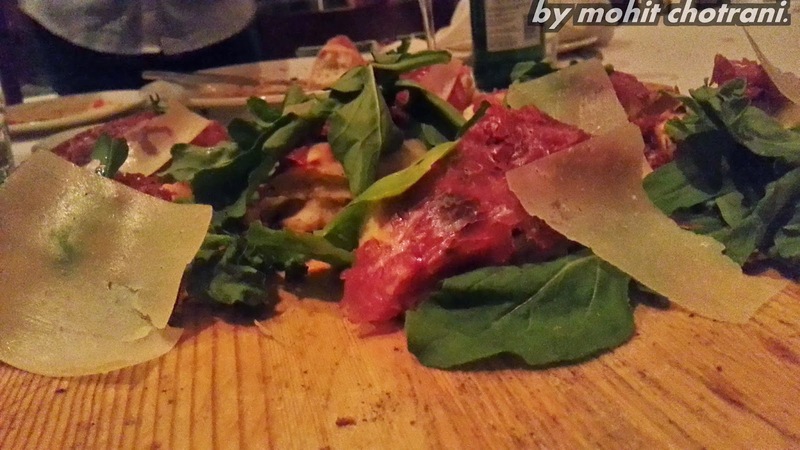 Since then he has made dozens of appearances in Italian restaurants and pizzerias around the world. So it was the day to meet the champion at J W Marriot - Mumbai where the Food Bloggers were reserved for a special chefs table, which consisted of the food, the drinks and special time to chat with the chef and learn and gain knowledge from him. While all were seated and getting to know each other, talking and sharing knowledge what they had, as many of us had met each other for the very first time. 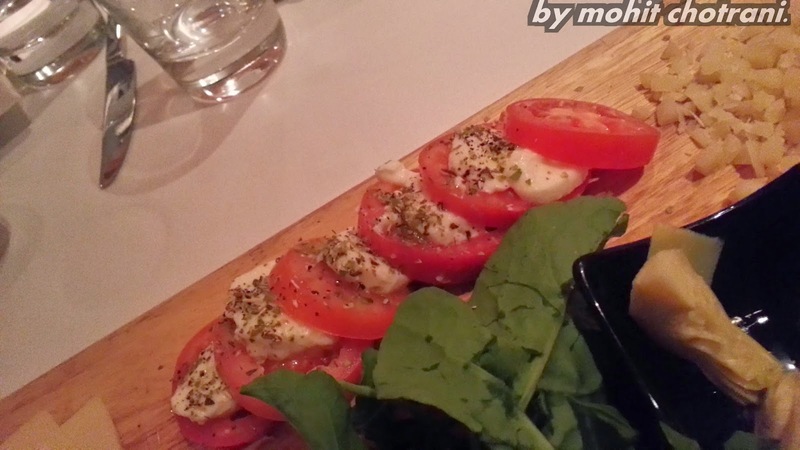 The first thing that came to the table were the anti pasti platter. 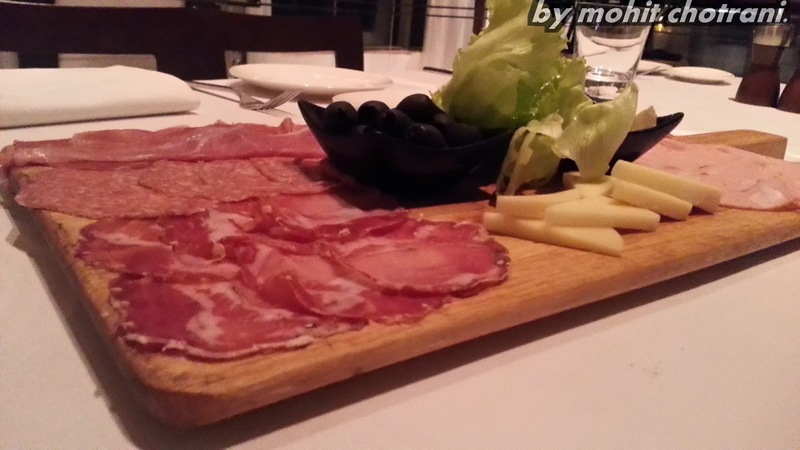 The word Anti-Pasti in Italy means before the meal and is like a appetizer which consist of cheese, bread, dips, some olives and the cold cuts from the region, like the parma ham, bresaola and more. 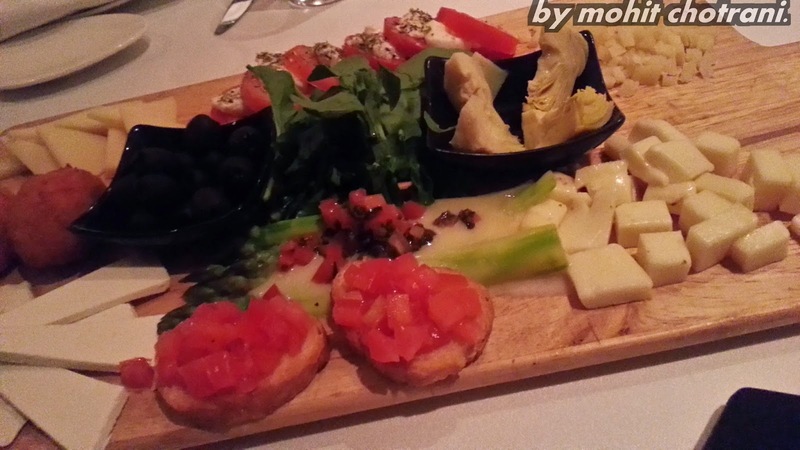 The cheese platter had varieties of cheese, like the Parmesan, Pecorino, salted Ricotta there were olives and artichokes to compliment them, and lastly there was the tomato and cheese caprese. As the food arrived, everyone got in to taking photos, like it was a celebrity or something and we all got some award wining clicks if I have to say. Soon the person for whom we all had come and were excited to meet arrived Chef Pasqualino Barbasso along with the head chef of the restaurant Mezzo Mezzo - Chef Davide Cananzi. 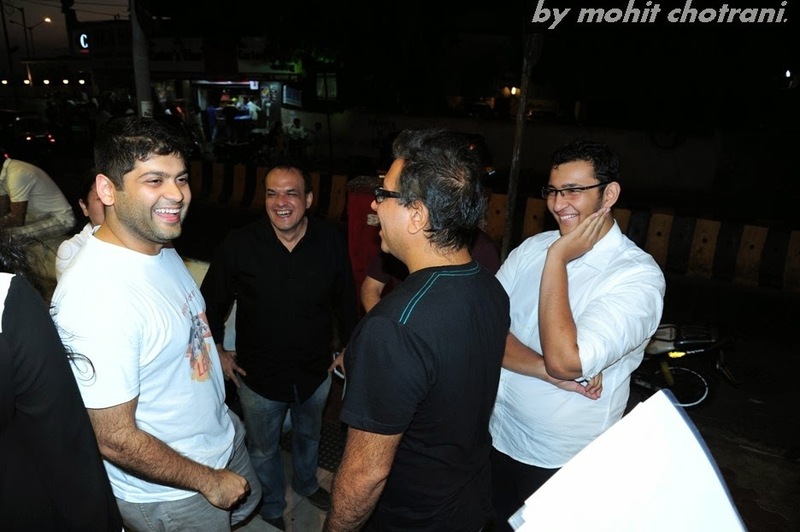 As time was passing, we all got so involved into getting to know the chefs tricks, recipes, his knowledge and what not. One thing i got to learn from him, myself being a chef was that how he makes his pizza sauce and whats the secret behind great food. The recipe was quite simple, just tomatoes, salt and basil which is blended to a puree and not cooked, and never to add onion and garlic he mentioned. And the secret to great dish was the simplicity and fresh ingredients. Also we came to know that his favorite pizza is the Margarita and loves cheese. He also got us some special chilli oil which was made from Sicily's special red chillies and the oil was to die for. 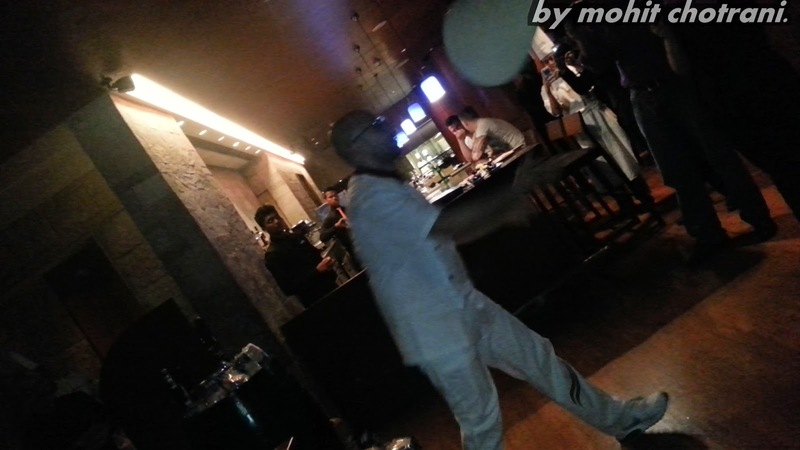 Soon the conversation got over and we were eagerly waiting for him to show us his talent in pizza acrobat for which he is know worldwide and travels doing shows all over the world. The time arrived, he got on the floor with the dough for which he is known and then it all began. At first it looked simple but as time was passing, I was shocked that a person can do this as well and that to with a simple pizza dough. For me what pizza dough was, just eating it with some toppings and cheese but this was out of the world. 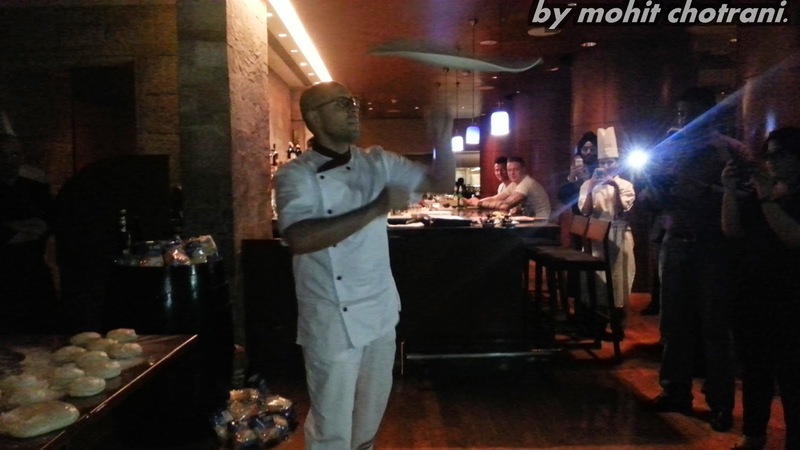 The show went on for like 15 mins or so and the whole restaurant had gathered to see the show and was astonished with what was going on and how Chef Pasqualino Barbasso was doing it. Once the show got over and all being still a bit shocked, went to the table and started talking about how can a person be so talented etc etc. Then to the table comes the chef asking for the feedback on how the show was, and we all were falling short of words, and dint know what to say, just speechless. By the way he spins the pizza dough, it was known that he can make 5 pizzas in 1 min and 10 seconds which is incredibly fast, I mean super fast. He then headed back to the kitchen to make some of his special pizzas for us like the Seafood Pizza with Caviar, The Salmon and Asparagus Cream Pizza, The Salami and Mushroom Pizza, the Ham and Cheese which was rolled and was full of cheese. The for the vegetarian. there was the Veggie Pizza, the Artichoke Pizza and one of the Chefs new creation and a new addition to the menu - The Mezzo Mezzo Pizza which had the Indian twist to it. It consisted of palak paneer with soft pieces of the paneer. Taste wise the pizzas, were soo light and thin, like a person can finish the whole all by himself. 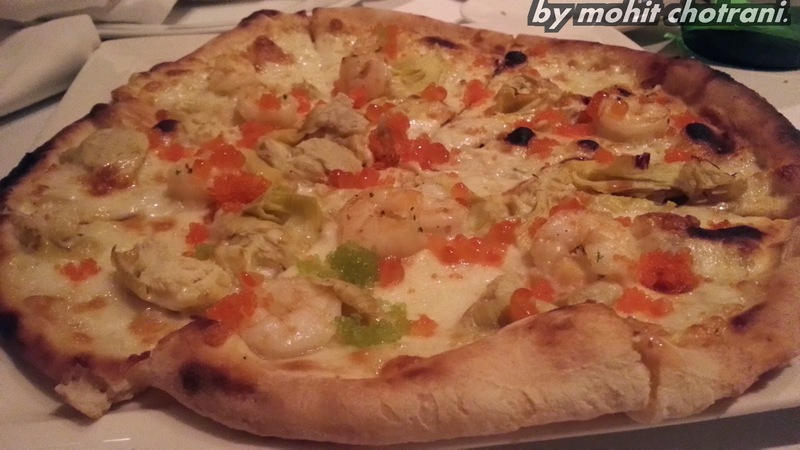 Personally not a fan of seafood, it was still amazing, the Seafood pizza which had Caviar, added an extra texture to the pizza, while having there were pops of the Caviar in the mouth which made it amazing. 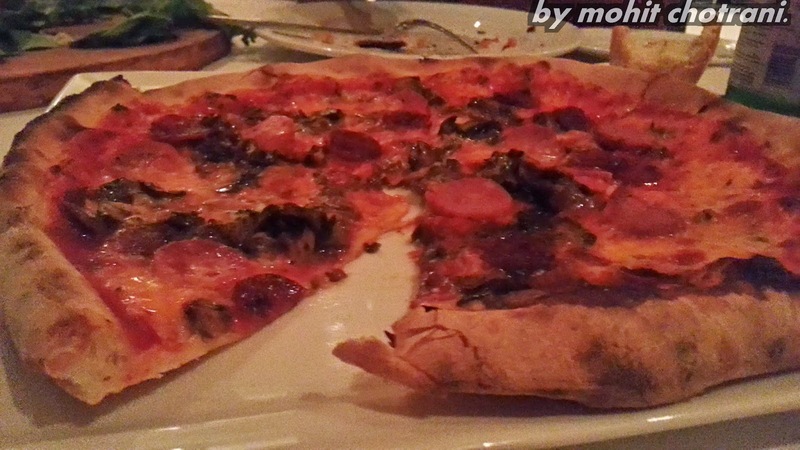 The Salami and the Mushroom Pizza was all the more better and full of flavors. Whereas the Ham and cheese was the best, it was full of cheese and was soft. 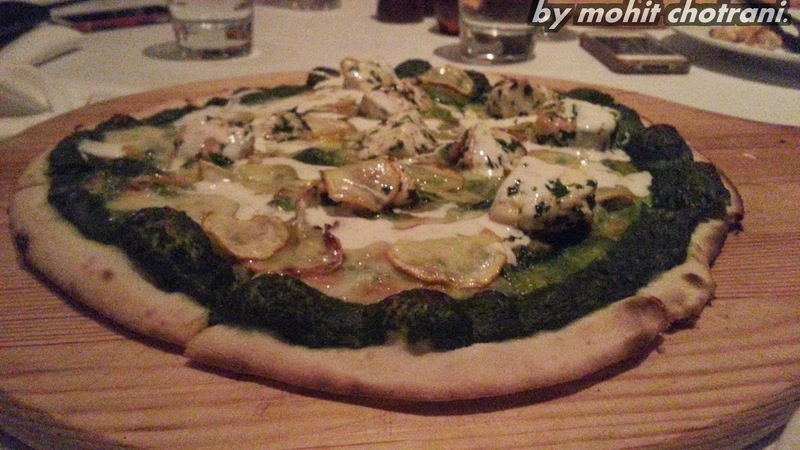 Lastly what I tried was the Mezzo Mezzo Pizza, which had the Indian touch, the palak paneer, honestly speaking, it was the best pizza with an Indian topping on it which I have ever had. So we were all done with the amazing pizzas, and were full by then, buy then we all forgot that we still have dessert left, my all time favorite 'Tiramisu', I can have it all day and night. This time the Italians favorite Tiramisu was much much better than what I had last time, it was soo light and was a healthier version, not soo sweet, just 'Perfecto' and spot on. I must say that it is the best Tiramisu I have had in a very long time and in Bombay. Now that everyone was done with the dessert, it was time for the group picture, a memory to cherish with ourselves. I dint leave the place empty handed, I had the memories to cherish, the people I met and the friends i made and the lovely evening I spent with the people. I would like to thank the Food Bloggers Association India for the invite, Chef Pasqualino Barbasso and J W Marriot for hosting the evening.